February 21 marks 50 years since the assassination of the black revolutionary activist Malcolm X. As the United States is shaken by mass protests in hundreds of cities against police racism and violence, and a new ‘Black Lives Matter’ movement emerges, Malcolm X ideas are attracting renewed interest. Evolving from black nationalism to anti-capitalism and towards socialism, he remains an inspiration to all who challenge the racist capitalist system. Poverty-stricken, alienated, and angry without answers, Malcolm drifted from shoe-shining to train porter, to petty crime, drug addiction and jail. While imprisoned, he converted to the Nation of Islam (NOI). The Nation of Islam was founded in 1931, preaching black pride and separatism – and quickly finding fertile soil among Afro-American convicts. Malcolm X described: “Here is a black man caged behind bars, probably for years, put there by the white man. Leaving prison, Malcolm X threw himself into building the Nation of Islam. He quickly became a leading minister: founding temples and the Nation’s newspaper; addressing meetings; raging against America’s racist history; articulating anger instinctively felt by oppressed Afro-Americans. The NOI swelled to 100,000 followers by the early 1960s. America’s mass civil rights movement which erupted in the mid-1950s, with protests like those of Rosa Parks (who refused to move from a ‘whites only’ bus seat), grew to involve in millions of black Americans demanding change. In Africa and Asia, revolutions swept away colonial rule. Revolutionary events combined with police brutality to spur on a mass movement. This criticism was directed against civil rights leader Martin Luther King. King later moved to the left, arguing for working-class unity and supporting strikers. This was not long before he too was murdered (4 April 1968). The LAPD (Los Angeles police) attacked a Nation of Islam temple in 1962, killing a leading activist. 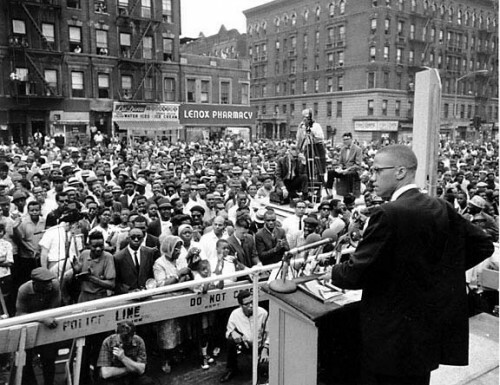 Malcolm X began a defence campaign, holding mass meetings. He supported a New York trade union boycott against a company refusing to employ black workers. But this contradicted the conservative NOI leaders, who took a sectarian line of “non-engagement” towards the civil rights movement and offered no practical alternative. Moves were underway to undermine Malcolm X, sanctioned by NOI leader Elijah Muhammad. Soon after this senior NOI members began to talk about killing Malcolm X.
Fifty weeks separate Malcolm X’s split with the Nation of Islam, and his murder which was orchestrated by the US state. Visiting Mecca for the Hajj pilgrimage, in Africa discussing with independence movement leaders, Malcolm’s ideas underwent a profound transformation. He met many non-Black “true revolutionaries, dedicated to overthrowing the system of exploitation that exists on this earth by any means necessary. Malcolm X launched a new organisation, ‘Muslim Mosque Inc’, to “…embrace all faiths of black men, and it would carry into practice what the Nation of Islam had only preached”. “This was a move that people had waited for. Numerous people said… they wanted to join me… Muslims wrote from other cities that they would join me, their remarks being generally along the lines that ‘Islam is too inactive’… ‘The Nation is moving too slow’”. After his international travels, Malcolm X wanted to develop links between the ‘Muslim Mosque Inc’ and Muslims across the world. His ideas continued to move towards those of working-class unity and socialism. This represented a real threat. Within weeks Malcolm was dead, assassinated by the state with NOI involvement. Malcolm X’s ideas have long been distorted. He has been falsely accused of being a “black racist”. The Nation of Islam claims him as their own. Yet shortly before Malcolm was killed, current NOI leader Louis Farrakhan said, “a man such as this is worthy only of death”. Some see Malcolm as a Muslim preacher. He filled his faith with the social struggle for liberation – beginning to reach out to all Afro-Americans, and then working-class whites, for unity against racism and poverty. Malcolm’s murder enraged a generation to rise up and fight. One million Afro-Americans considered themselves revolutionary. The Black Panther Party, founded in 1966, organised community defence against racists and police, and drew some socialist conclusions. Socialist Action stands in the best traditions of mass struggle and self-defence, for working-class unity of all races, religions, and countries. This is a slightly edited version of an article that first appeared in 2005 in The Socialist, newspaper of the CWI in England and Wales.